It was Half Price Day at the local self-service yard last weekend, and I had my eye on a Porsche 928 that had been there the week before, thinking I could buy that purty Porsche intake manifold to hang on my wall. 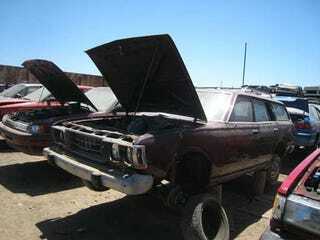 Sadly, the 928 had already gone to The Crusher, so I decided I might as well check for other interesting stuff... and, sure enough, here was a super-rare '74 Datsun 610 wagon. The L20B is still there, and so is the factory 8-track player. Well, the 8-track was there, since I felt compelled to grab it. After buying all those 8-track tapes for the Junkyard Boogaloo Boombox, I need a backup deck!